Attorney Helen Stolinas has been practicing in the field of criminal defense and trying cases for over 25 years. She has represented thousands of individuals in matters ranging in seriousness from summary and misdemeanor offenses, up to and including capital homicides. Helen began her career in the Bradford County Office of the Public Defender, first as Assistant and eventually being promoted to Chief of that office. Helen became involved with the Public Defender’s Association of Pennsylvania, and served as President of that organization. In January, 2016, Helen joined The Mazza Law Group, where she continues to practice Criminal Defense, as well as Immigration and Civil Litigation. She is admitted to practice in Pennsylvania, as well as Federal Court in the Middle and Western Districts of Pennsylvania. Having argued before the Superior and Supreme Courts of Pennsylvania, Helen has had success in a number of matters, including most recently Grove v. PSP…., which upheld a lower court ruling mandating that the State Police provide dashcam video under the Right to Know Law. Another niche area of Helen’s practice is restoration of firearm rights in cases where an individual was wrongly committed to involuntary mental health hospitalization under Section 302 of the Pennsylvania Mental Health Procedures Act. The law provides for expungement of unlawful 302 commitments, and Helen has successfully litigated this issue on behalf of several clients. 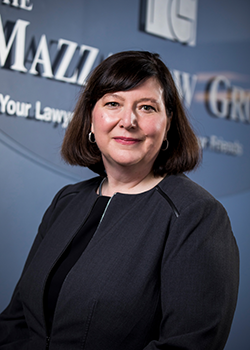 Since joining the Mazza Law Group, Helen has had the opportunity to practice Immigration Law as well, with a focus on family-based immigration, student visa issues, and “Crimmigration”- assisting non-citizens in minimizing the impact of criminal charges.